Maintaining posture and balance is important in this dicey situation. When it's useful: The ball sits in a steep-sided bunker. It's so steep, in fact, that you'd have to squat like a sumo wrestler in order to get the clubhead near the ball, or bend so far forward that you'd be in danger of toppling into the hazard. How to hit it: Drop to a knee. Even from this awkward stance, you're in better position to maintain posture and balance than if you create extreme angles in your knees and spine tilt. 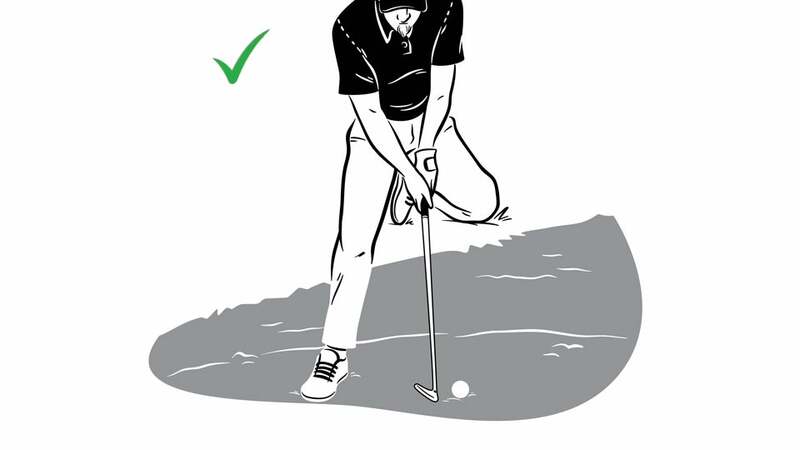 Rest your left knee on the turf above the hazard while securing your right foot in the bunker. Tilt forward until the club hovers above the sand behind the ball. This stance lets you generate speed with your arms and hands only, but that's fine—it's what you want to do on a bunker swing anyway. Funky stance, same motion. Easier than you think!